European Union foreign policy chief announces plans to visit Iran within weeks, after being invited by the country's foreign minister. 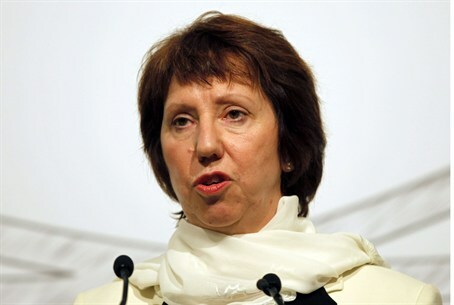 European Union foreign policy chief Catherine Ashton said in Kuwait City on Monday she plans to visit Iran within weeks, AFP reported. The comments came two days after Tehran invited Ashton to the country. "I read with interest the invitation to visit Tehran and it is my intention to do so in the course of the next weeks," Ashton was quoted by AFP as having told a press conference after talks with Kuwait's Foreign Minister, Sheikh Sabah Khaled Al-Sabah. Iranian Foreign Minister Mohammad Javad Zarif had invited Ashton to visit Tehran, Mehr news agency cited his deputy as saying on Saturday. "Ashton has received an open invitation from Zarif to travel to Iran whenever she wants," Abbas Araqchi, the deputy negotiator in talks on Iran's nuclear program, said without giving any dates for the proposed trip. The EU official is currently on a tour of the Gulf to discuss Syria, the nuclear deal with Iran and Israeli-Palestinian Authority peace efforts. She has already visited the United Arab Emirates. Ashton called for the implementation of the nuclear deal signed between the Western powers and Iran in November, saying the EU would "verify the actions on these (nuclear) sites". She added that it was vital the "political agreement now translates into practical things," and expressed her hopes a comprehensive agreement could be reached "shortly," according to AFP. On Sunday, President Barack Obama confirmed that the agreement reached with Iran in Geneva in November would be implemented starting January 20. Under the agreement, six major powers agreed to give Iran access to $4.2 billion in revenues blocked overseas if it carries out the deal, which offers sanctions relief in exchange for steps to curb the Iranian nuclear program. A senior American official later revealed that as part of this implementation, Iran will receive the first $550 million installment of a total of $4.2 billion in previously blocked overseas funds on or about February 1. Ashton’s visit to Iran is part of the rapprochement between Tehran and the West which has been taking place since President Hassan Rouhani took office. Last month, Italian Foreign Minister Emma Bonino arrived in Tehran for a rare visit by a senior European official to the Islamic Republic. Shortly after taking office, Rouhani began working to smooth relations with the West. His efforts were rewarded when he received a telephone call from U.S. President Barack Obama in September, the first of its kind between an American and Iranian president in more than three decades. More recently, Britain resumed its ties with Iran, two years after severing diplomatic relations due to a 2011 embassy attack. As well, British Prime Minister David Cameron recently became the first UK prime minister in more than a decade to call an Iranian president when he phoned Rouhani to discuss Iran's nuclear program.